Sometimes, when there is such a big task in front of us, such as preparing for IELTS, it can be difficult to even get started. Then, when we actually jump on that road, start working through our study plans one task at a time, we hit a wall. We feel like we are investing so much time and energy that we lose our motivation to keep moving ahead. So, today, we are going to look at 5 motivational quotes, and connect them directly to our IELTS practice. Choose your favorite one and hang it on your wall! Can watching a movie today really help you improve your IELTS score in the future? Find a way to enjoy your English practice and still directly connect it to the exam. For example, after watching a movie, write a 4-paragraph essay about it. You describe two sides in the body- one paragraph which talks about why the movie was fantastic, and one paragraph which talks about why the movie was terrible. This would mirror the Argument essay you may have to write in the exam. Get a simple checklist. Find out exactly what to do. Stop wasting time on the wrong activities. Click here to get your checklist now! Even if all you need is a 6 or a 6.5 in IELTS, aim higher! Learn what the examiner is looking for in order to get a band score 8, for example. Then, you will move your practice to a higher level, and challenge yourself. Even if you don’t end up getting an 8, perhaps you’ll at least get a 7! This is good motivation and a good guide for your Speaking exam practice. Remember that in the Speaking exam, the examiner will control the time for you. Just remember that the examiner wants to hear you speak English, so never, ever, give one word or one sentence answers. Remember this motivational advice when preparing for the Writing exam. In the months leading up to the exam, do not worry about timing. You should go slowly, taking all the time you need to plan, write and check your essays, following the advice and strategies of your teacher. Then, when the exam gets closer, you can start timing yourself and worrying about speed. Try to only start timing your writing two weeks before the exam. If you don’t believe you can hit that 7+, you won’t be able to. Analyze your strengths and weaknesses, and be honest with yourself about the work it will take to improve. But always, always believe you can! Which of these quotes is the most inspiring to you? 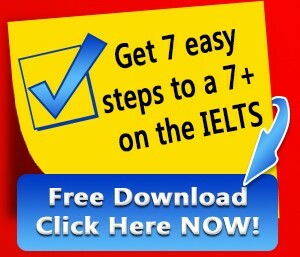 What part of IELTS are you struggling with the most?